The Global Volcanism Program has no activity reports for Ceboruco. The Global Volcanism Program has no Weekly Reports available for Ceboruco. The Global Volcanism Program has no Bulletin Reports available for Ceboruco. 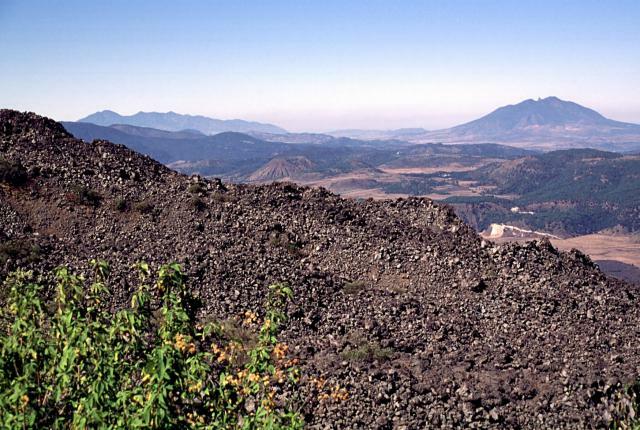 Volcán Ceboruco is the only historically active volcano in the NW part of the Mexican Volcanic Belt. 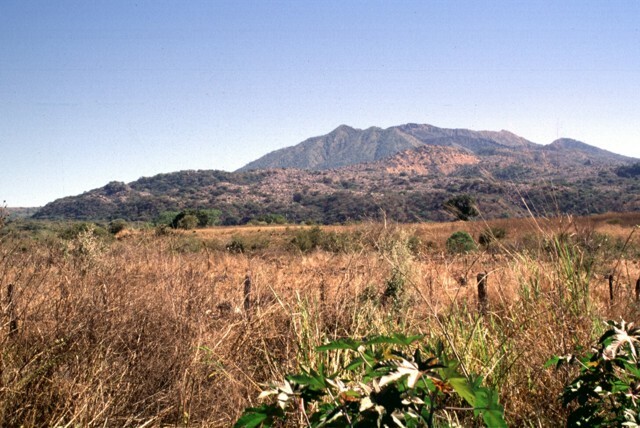 The complex stratovolcano rises above the floor of the Tepic graben and is truncated by two concentric summit calderas. Eruption of the voluminous rhyodacitic Jala Pumice, the largest known in México during the Holocene, formed the initial 4-km-wide caldera about 1000 years ago. The second caldera, 1.5 km wide, was formed by collapse of part of the large Dos Equis dacitic lava dome, which partly filled the earlier caldera. About 15 basaltic and andesitic cinder cones and lava flows have erupted along a NW-SE-trending line cutting across Ceboruco. The massive, sparsely vegetated El Norte lava flow, probably erupted in the past few hundred years, blankets the entire N flank. The last eruption took place during 1870-75. Explosive eruptions from a vent on the upper west flank accompanied extrusion of a 1.1 km3 dacitic lava flow that covers a large area on the lower W flank. Browne B L, Gardner J E, 2004. The nature and timing of caldera collapse as indicated by accidental lithic fragments from the AD ~1000 eruption of Volcan Ceboruco, Mexico. J. Volcanol. Geotherm. Res., 130: 93-105. Browne B L, Gardner J E, 2005. 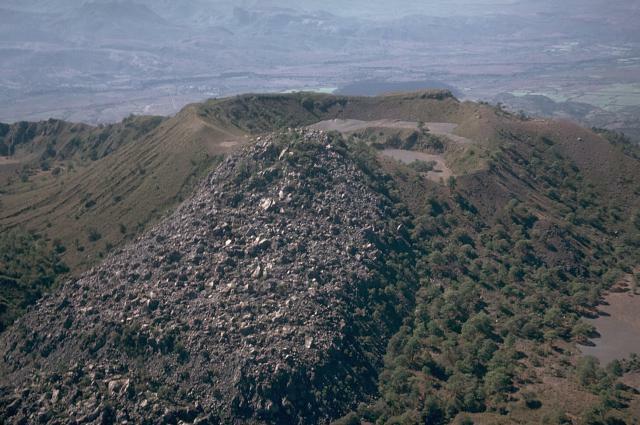 Transport and deposition of pyroclastic material from the ~1000 A.D. caldera-forming eruption of Volcan Ceboruco, Nayarit, Mexico. Bull Volcanol, 67: 469-489. Frey H M, Lange R A, Hall C H, Delgado-Granados H, 2004. Magma eruption rates constrained by 40Ar/39Ar chronology and GIS for the Ceboruco-San Pedro volcanic field, western Mexico. Geol Soc Amer Bull, 116: 259-276. Gardner J E, Tait S, 2000. The caldera-forming eruption of Volcan Ceboruco, Mexico. Bull Volcanol, 62: 20-33. Martin U, Nemeth K, 2006. 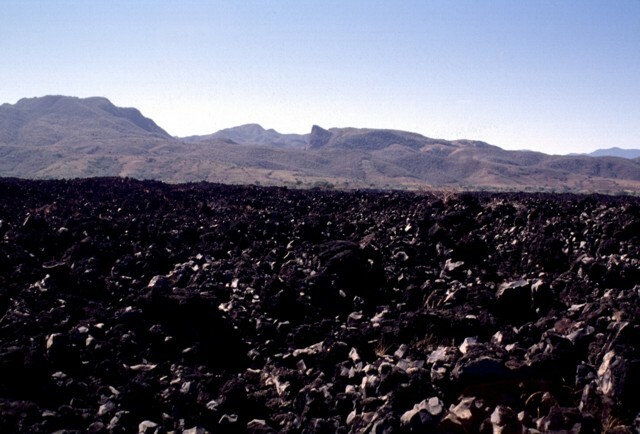 How Strombolian is a "Strombolian" scoria cone? Some irregularities in scoria cone architecture from the Transmexican Volcanic Belt, near Volcan Ceboruco, (Mexico) and Al Haruj (Libya). J. Volcanol. Geotherm. Res., 155: 104-118. Nelson S A, 1980. Geology and petrology of Volcan Ceboruco, Nayarit, Mexico - Summary. Geol Soc Amer Bull, 91: 639-643. Nelson S A, 1986. Geologia del Volcan Ceboruco, Nayarit, con una estimacion de riesgos de erupciones futuras. Univ Nac Auton Mexico, Inst Geol Rev, 6: 243-258. There is no Deformation History data available for Ceboruco. There is no Emissions History data available for Ceboruco. 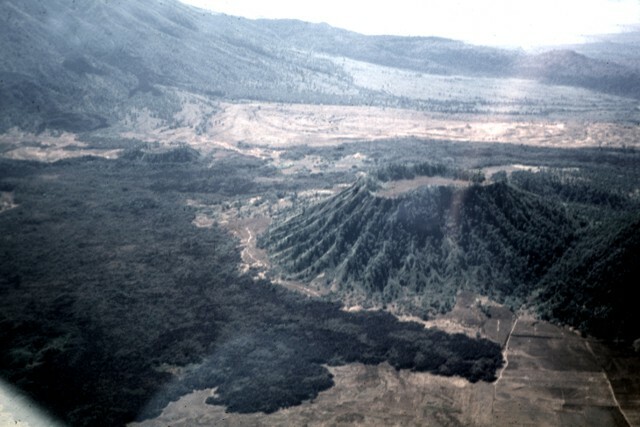 The most recent eruption of Ceboruco volcano began in 1870 and produced the block lava flow seen in this aerial view from the west. Explosive eruptions began from a vent near the west caldera rim in February 1870 and continued with emission of the 1.1 cu km lava flow, which traveled 6 km down to the lower flank of the volcano. The eruption continued sporadically for 5 years, causing extensive damage to livestock and crops. Hundreds of people were forced to abandon their homes. Photo by Jim Luhr, 1980 (Smithsonian Institution). 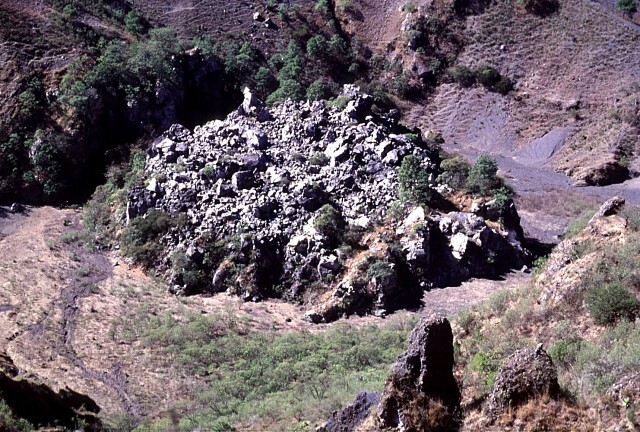 A small dacitic lava flow, possibly produced during the 1870-75 eruption of Ceboruco volcano or earlier historical eruptions, descended eastward from the rim of a large cinder cone within the inner caldera of Ceboruco. The viscous flow traveled only 500 m to the east. A small crater to the right of the flow is nested within the NE side of the larger crater at the top of the cinder cone. These are part of a complex group of volcanic features within Ceboruco's nested summit calderas. 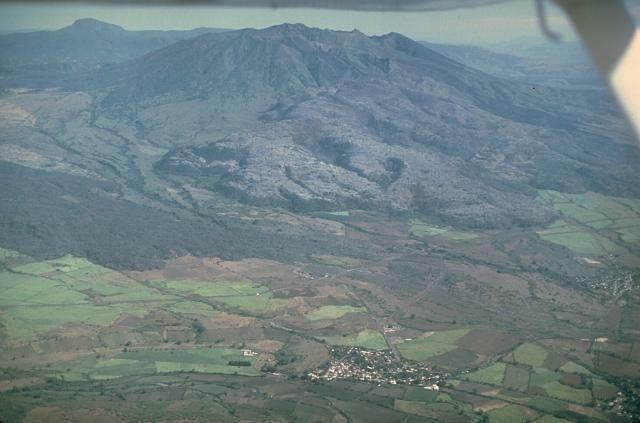 The El Norte lava flows, which blanket much of the northern flank of Ceboruco volcano, were erupted from buried ring fractures of Ceboruco's nested calderas. The flows cover much of the central portion of this aerial view from the NW and divided into two lobes, a broad northern lobe that reached the base of the volcano and a narrower NW lobe (lower right). The southern wall of the inner caldera forms the irregular ridge extending across the photo. This aerial view looks from the east across the inner summit caldera of Ceboruco volcano. The unvegetated dacitic lava flow in the center was emplaced either in 1870-75 or during earlier historical eruptions in 1542 or 1567. The flow filling the caldera floor at the lower right is the near-vent portion of the voluminous El Norte lava flows. The ridge in the foreground is the eastern rim of the inner caldera of Ceboruco. 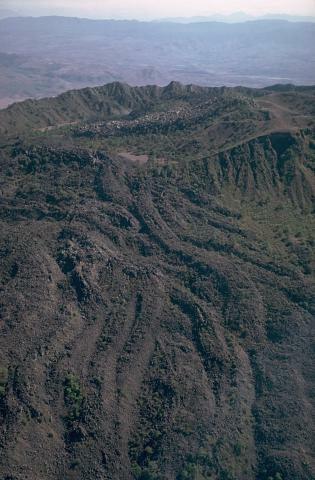 The braided El Norte lava flows cover most of the northern flank of Ceboruco volcano in western México. They were erupted along the ring fracture of one of the two nested summit calderas. The south wall of the inner caldera forms the far summit ridge. The andesitic El Norte flows blanket a 3.5 km length of the northern flank, and form a broad, 3.5-km-wide terminous at the base of the volcano. Their youthful morphology and unvegetated surfaces suggest a very young age, possibly during one of the two-16th century eruptions of Ceboruco. The SW rims of the two nested calderas appear at the upper right in this aerial view of the western part of the summit of Ceboruco. The vent of the 1870-75 eruption is capped by the small lava dome at the lower center. A massive lava flow erupted early during the 1870 eruption descended to the lower right corner of the photo. Its levees are higher than the crater floor filled by the plug dome. This indicates that the original vent of the lava flow was destroyed by explosions that formed the crater in which the lava dome was emplaced. 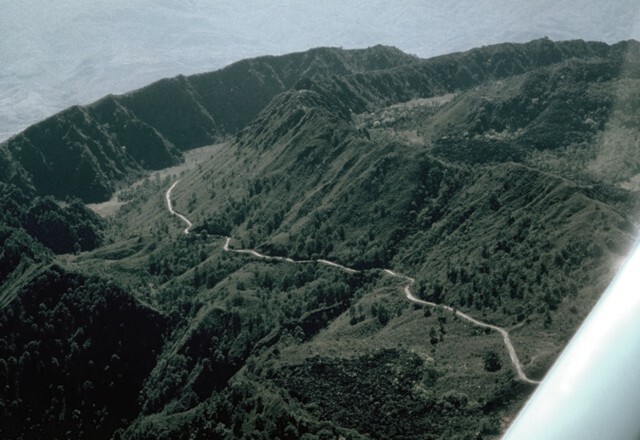 The walls of two nested summit calderas are seen here in an aerial view from the NE, with the road to the summit microwave station traversing the narrow caldera moat. 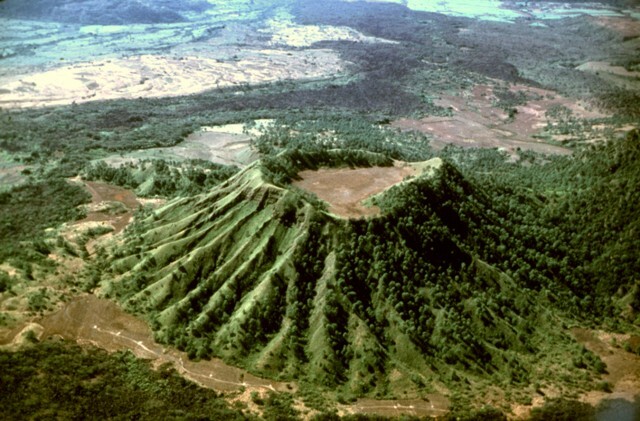 The formation of Ceboruco's 3.7-km-wide outer caldera was associated with eruption of the 5 cu km Jala Pumice and the Marquesado pyroclastic flow about 1000 years ago. The rhyodacitic Jala Pumice blankets broad areas north and east of the volcano. Volcán Ceboruco is a small, but complex stratovolcano with two concentric summit calderas. 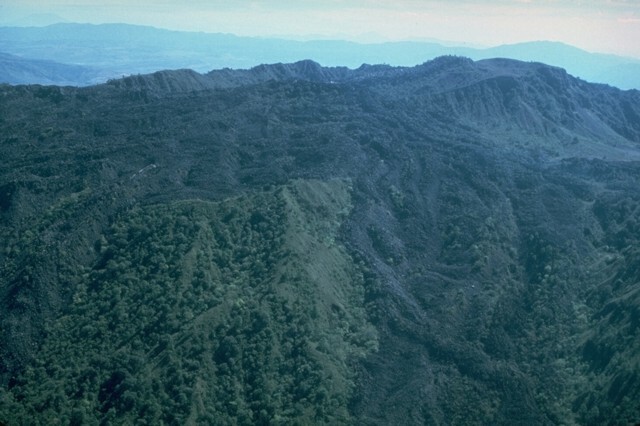 The prominent thick lava flow (center) on the western flank was emplaced during Ceboruco's last eruption in 1870-75. Eruption of the rhyodacitic Jala Pumice formed the initial 4-km-wide caldera of Ceboruco about 1000 years ago. The second caldera was formed by collapse of part of the large Dos Equis dacitic lava dome, which partly filled the earlier caldera. About 15 cinder cones and lava flows have erupted along a NW-SE-trending line cutting across Ceboruco. Ceboruco volcano, seen here from the west, is truncated by two summit calderas. 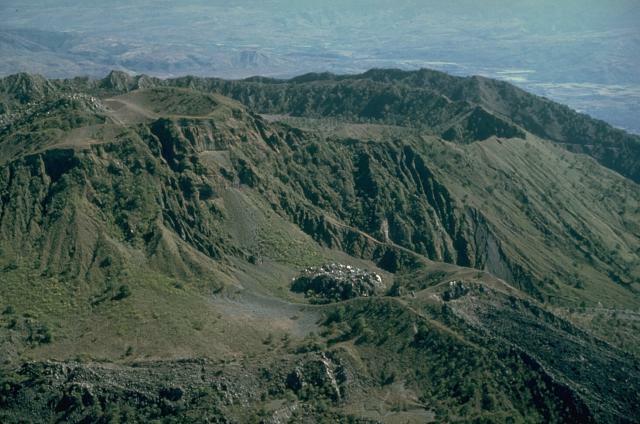 The rim of the older caldera, which collapsed about 1000 years ago following eruption of the Jala Pumice, forms the peaks at the left and right sides of the summit. The thick, compound light-gray-colored lava flow at the mid left and center part of the photo was produced during Ceboruco's last eruption in 1870-75. Photo by Jim Luhr, 1974 (Smithsonian Institution). 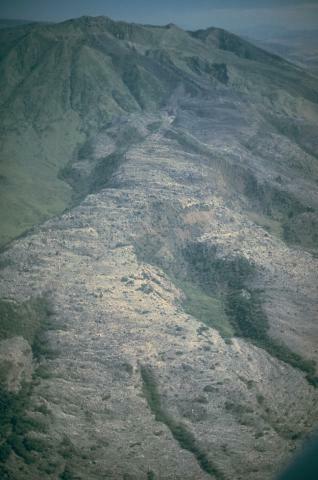 The sparsely vegetated ridge extending across the center of the photo is the steep-sided distal margin of the 1870 lava flow. 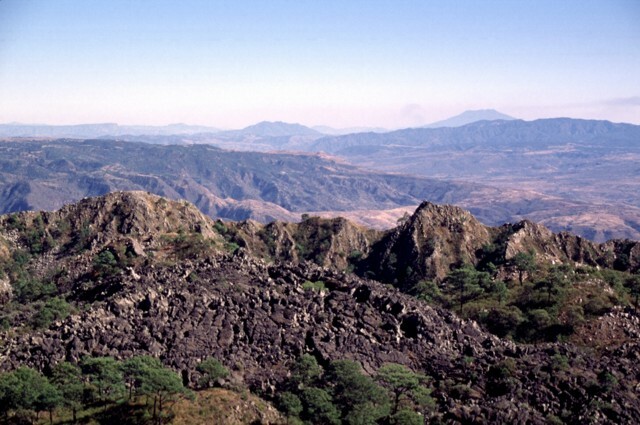 The 1.1 cu km dacitic lava flow originated from a vent at the western side of Ceboruco's nested summit calderas and traveled 6.5 km down the Arroyo de los Cuates valley to about 900 m elevation. The notch on the right-hand side of Ceboruco's summit ridge is the moat between the volcano's nested calderas. The fresh-looking, unvegetated Ceboruco lava flow in the foreground appears to be the youngest of Ceboruco's west-flank lava flows, and has been confused with the nearby, more-vegetated 1870 lava flow. Maps published at the time of the 1870 eruption clearly show, however, that the Ceboruco flow existed prior to 1870. The volcano draws its name from El Ceboruco lava flow, which means "spongy rock." The peaks on either side of Ceboruco's broad summit in this view from the WSW are the rims of the volcano's 4-km-wide outer caldera. Highway 15 cuts across the blocky Ceboruco lava flow on the SW flank of Ceboruco volcano. Despite its fresh, unvegetated appearance, this flow was not emplaced during the latest eruption of Ceboruco. Maps made at the time of the 1870-75 eruption show that this flow existed prior to the 1870 eruption. The flow is referred to as El Ceboruco ("spongy rock" in the local dialect). The andesitic El Ceboruco lava flow extends 7 km down the SW flank of the volcano. Pliocene ignimbrites form the hills in the background. The massive El Norte lava flows of Ceboruco in the foreground blanket much of the northern flank of the volcano. These extremely youthful flows, erupted from vents within the inner summit caldera, may have been emplaced during one of two 16th-century eruptions of Ceboruco. The andesitic lava flows traveled 3.5 km down the north flank and formed a broad, 3.5-km-wide front at the base of the volcano. The broad volcano with the irregular profile in the left distance is Tepetiltic. Sangangüey stratovolcano forms the peak at the upper right. 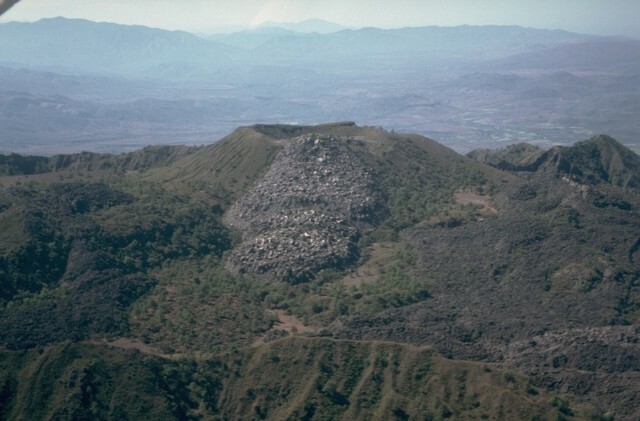 The inner caldera rim of Ceboruco forms the ridge extending across the photo in this view looking toward the SE from near the summit of the volcano. The inner caldera wall consists of massive dome lavas that were emplaced within the outer caldera. The unvegetated lava flow in the foreground was erupted, probably in 1870, from a vent within a cinder cone complex at the western side of the inner caldera. 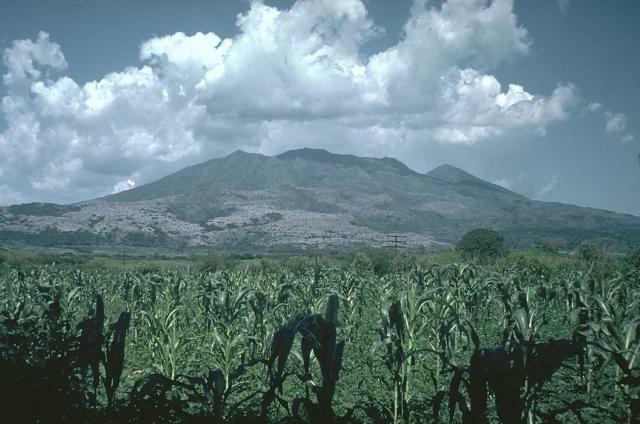 Flat-topped Volcán Tequila forms the peak in distance at the upper right. 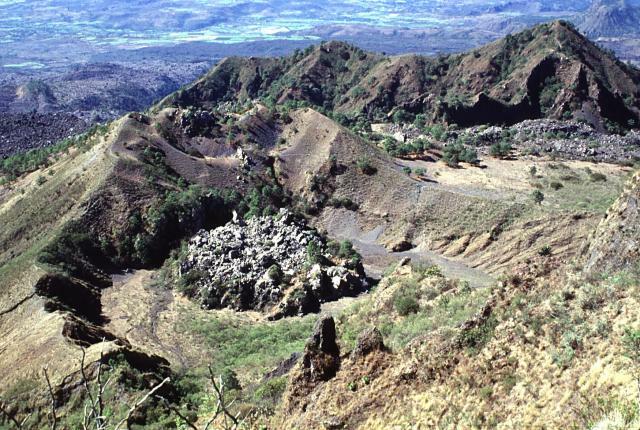 The small blocky lava dome on the floor of the crater at the left center was emplaced late in the 1870-75 eruption of Ceboruco. Levees of a massive lava flow that traveled 6.5 km down the west flank are higher than this crater, indicating that the main 1870 vent that fed the flows was probably located above the position of the plug dome. Explosions later in the 1870-75 eruption formed this crater. The ridge at the upper right is the NW wall of the outer caldera. The summit of Ceboruco volcano provides a panoramic view of the 1870 vent and the San Pedro-Ceboruco graben. The small lava dome at the lower right and the unvegetated lava flow at the lower left were emplaced during the 1870-75 eruption of Ceboruco. The compound Cerro San Pedro lava dome on the horizon directly above the small 1870 dome was constructed within the 7 x 10 km San Pedro caldera. The peak immediately left of Cerro San Pedro is Cerro Tetillas, and the dark-colored area to its left is the Cerro Grande shield volcano. Erosional gulleys cut the flanks of Molcajete Grande, a large andesitic pyroclastic cone with a flat-bottomed crater located on the lower NW flank of Ceboruco volcano. This aerial view from the NE shows the forested andesitic Coapan lava flow beyond the cone. The lighter-colored area just beyond the Coapan lava flow (upper left) is underlain by the Destiladero rhyodacitic lava flow. 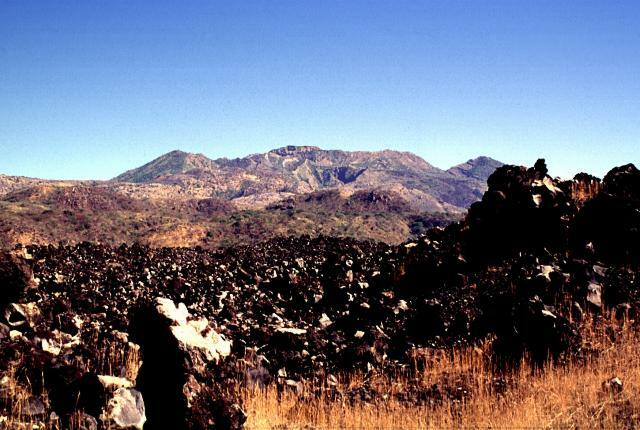 The dark-colored Coapan andesitic lava flow surrounds Molcajete Grande pyroclastic cone (right center) on the NW flank of Ceboruco volcano, whose slopes are visible at the upper left. 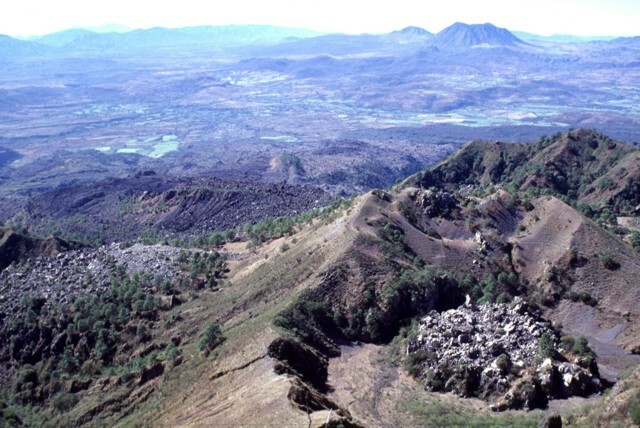 The light-colored area cutting horizontally across the upper part of the photo beyond the forested Coapan flow is the rhyodacitic Destiladero lava flow. The flat-lying light-colored area beyond this flow is a pre-caldera andesitic flow, and the ridge on the horizon is the 1870 west-flank lava flow. Photo by Jim Luhr, 1979 (Smithsonian Institution). Large Eruptions of Ceboruco Information about large Quaternary eruptions (VEI >= 4) is cataloged in the Large Magnitude Explosive Volcanic Eruptions (LaMEVE) database of the Volcano Global Risk Identification and Analysis Project (VOGRIPA).